Del Parkinson, began studying piano at the age of five in his hometown of Blackfoot, Idaho. He now holds a Doctor of Music degree from Indiana University and a Postgraduate Diploma from the Juilliard School. He was the recipient of a Fulbright-Hays grant for graduate study in London, England. His London debut recital was on the American Bicentennial Series. His New York debut recital in Carnegie Recital Hall was sponsored by the Idaho Commission on the Arts. His first appearance with orchestra came at the age of thirteen. Other concerto performances have included the Guadalajara Symphony, Indiana University Symphony, Civic Orchestra of Chicago, Boise Philharmonic, and the Utah Symphony. In 1988, he was designated as the recipient of the Idaho Governor’s Award for Excellence in the Arts. Dr. Parkinson was Coordinator of Piano Instruction at Ricks College, where he taught for eight years. 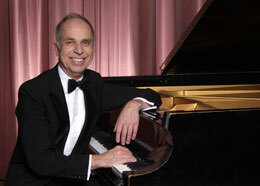 He is now Professor of Piano at Boise State University.